Tmall GlobalPremium fashion brand A is eager to expand into the China market but reluctant to take on local inventory risk. Tmall Global allows brand A to enter the China market while removing this risk. Baby formula brand B has noticed a recent increase in overseas purchase demand for their product. Tmall Global offers brand B the opportunity to reach these consumers. Specialty food brand C had previously thought selling finished food product directly to the China market to the impossible. Tmall Global enables brand C to bring their locally famous product to Chinese shoppers. Tmall.comApparel brand X has been selling offline in China for 5 years and has already built up a following among their target market. 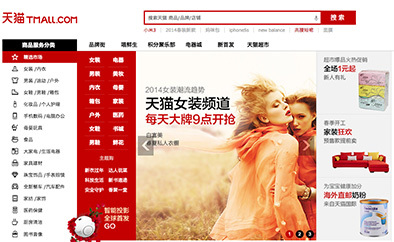 Brand X will soon open a Tmall.com store to introduce their product to a wider audience. Children’s toy brand Y has been manufacturing product in China for foreign markets and would now like to try selling their branded toys to the Chinese domestic market. Brand Y would open a Tmall store and utilize their local inventory for fulfillment.